CU by Day: Flags and Banners! I have a super cool new product for you today, I had so much fun playing with it to make some samples.. it's a kit for making custom banners! 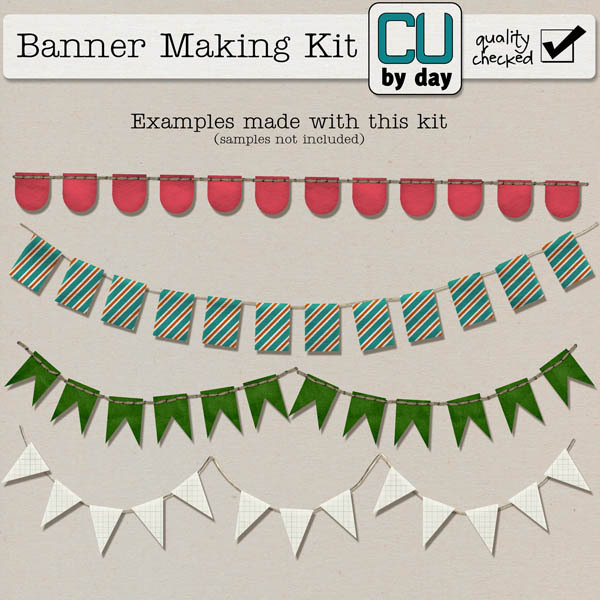 These fun whimsical elements are in so many kits these days and everyone loves them on their LO, this kit will make it even easier for you to make unique banners for every kit you make! This kit includes templates for 16 different banners (4 flag styles/4banner styles), 2 types of hangers (string and stitches in all 4 styles each), a style set with shadows and highlights as well as a paper and a fabric style for adding awesome texture instantly and finally a wee staple in case you want to staple your banner down! And of course, it's on sale this weekend only for 25% off! And here's a little sample of some banners I whipped up. Just imagine what you could do with this! Feel free to link me up to anything you make using my products, I always enjoy seeing what you come up with! Sweet Nothings... and blue skys! Brads brads and more brads! !